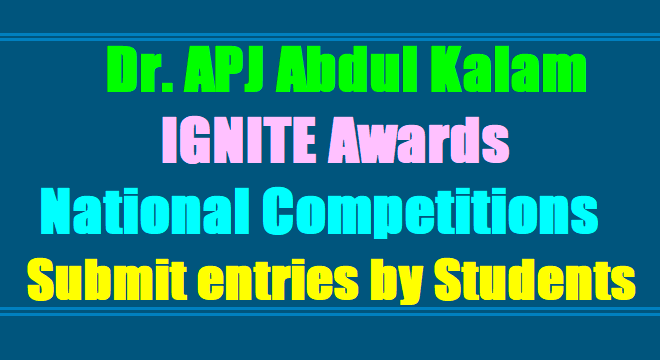 Dr. APJ Abdul Kalam IGNITE Awards National Competitions 2018, Submit entries before August 31: Dr. APJ Abdul Kalam IGNITE national competition, Dr.APJ Abdul Kalam Awards, IGNITE 2018, Dr.APJ Abdul Kalam IGNITE Awards 2018, IGNITE awards to students for10th National competition for students' ideas and innovations. Last date for submission of entries, Send Entries by email/ Post/ Submit Entries Online for Contest. National Innovation Foundations is organising Dr.APJ Abdul Kalam, IGNITE Competition 2018 - National wide Competition of students original technological ideas and Innovation in Collaboration with the Honey Bee Network, CBSE. The entries have to be submitted by the students up to standard XII or children up to the age of 17 years, in or out of School. NIF invites submissions of creative technological ideas/innovations from the students up to Standard XII for the tenth national competition for children's ideas and innovations -Dr A P J Abdul Kalam IGNITE Awards 2018.NIF dedicates the IGNITE Awards in the loving memory of Dr Kalam. Sub: SCERT, A.P., Amaravathi - Dr.APJ Abdul Kalam - IGNITE Competitions 2018 - Submission of entries by students - Orders - Issued. All the District Educational Officers are informed that National Innovation Foundations is organising Dr.APJ Abdul Kalam, IGNITE Competition 2018 - National wide Competition of students original technological ideas and Innovation in Collaboration with the Honey Bee Network, CBSE. The entries have to be submitted by the students up to standard XII or children up to the age of 17 years, in or out of School. Hence all the District Educational Officers are requested to issue suitable orders to the school authorities of all managements to motivate their students to actively participate in the competition by submitting their entries and possibly win an award at the national level. The ideas innovations can be about improvement in any existing, machine or product, which increase its efficiency, output or reduces drudging or about an entirely new machine or gadget to improve life of people. The last date for submission of entries is 31-08-2018. Guidelines for submission of entries announcement by NIF and proforma of application are annexed. The District Educational Officers are further requested to give wide publicity through electronic, print media and discussing in the Head Masters meetings to disseminate the information of IGNITE awards to students, out of school children teachers, parents etc. a. The last date of submission of entries to NIF, directly by students or through schools, at the following address or through email at ignite@nifindia.org is August 31, 2018.
ii. Real life technological projects demonstrating innovative ways of solving problems or reducing drudgery or generating efficiency or conserving resources (projects demonstrating application of known scientific concepts or theories will not be accepted). iii. Traditional knowledge practices documented from elders in and around one's family. c. Each entry (in case of i and ii above) should be accompanied with a certificate from parents and teachers saying that the idea I innovation has been developed and documented by the student concerned entirely on his I her own without any guidance or support from their. National Innovation Foundation (NIF), India, an autonomous body of the Department of Science and Technology, Govt. of India, announces the tenth national competition for students' ideas and innovations, in association with the Honey Bee Network, SRISTI, CBSE and other partners. In order to promote creativity and originality in children, NIF has been organising IGNITE - a national competition of original technological ideas and innovations by children, up to Standard XII or the age of 17 years, in or out of school. Starting in 2008, in the past nine years, 201 awards have been given to 277 children. The total number of submissions from school children received during the various IGNITE campaigns is 1,54,500. NIF decided to commemorate the IGNITE Awards in his memory and rechristened the awards as Dr APJ Abdul Kalam IGNITE Awards, so that creative children continue to draw inspiration from his spirit. NIF will continue to announce the awards every year on October 15, Dr Kalam's birthday, which is also celebrated as the Children's Creativity and Innovation Day by NIF. Dr APJ Abdul Kalam IGNITE competition is an annual national competition to harness the creative and innovative spirit of children (up to Standard XII in school or those up to the age of 17 years out of school). Students are invited to send their original and creative technological ideas and innovations for the same. Creativity among children is almost innate. Every child is creative, the degree may vary though but, not its basic manifestation. Then what happens during growth and maturation? Why should children stop asking basic questions? Why do they agree to do repetitive science projects instead of being original? Why do they learn to live with unsolved social and professional problems? We should not allow our children to live with such problems. Rather, we must urge them to come up with solutions to these. We want to promote originality, creativity and innovative spirit among our children so that when they become leaders of our society, they ensure an imaginative, inclusive and innovative future for the country. We want our children to be more sensitive to the problems faced by not just them and their families or neighbours but also other socially-disadvantaged sections of the society. What is invited for the contest? Original and creative technological ideas and innovations of the students OR/AND any technological idea/innovation that solves any daily-life problem, be it household or of porters, labourers, or the likes. In addition, during their vacations or otherwise, the students are encouraged to look for other people who come out with innovative machines/devices or solve day-to-day problems using their creativity. Similarly, they are also encouraged to document and learn traditional knowledge (TK) practices from elders in their families and neighbourhood. The purpose is to expose them to the rich traditional heritage that we have, facilitating its transfer from generation to generation. The students submitting the maximum number of properly-documented entries (innovations/TK) to the schools (which would forward them to NIF) or directly to NIF, would be given appreciation certificates. For each innovation/TK practice spotted and documented by the student, he/she will be credited as being the 'scout' of that innovation/TK in records. What is the contest period? The entries will be received till August 31, 2018. All entries received after this date will be considered for Dr APJ Abdul Kalam IGNITE 2018 competition. Can students of other educational boards (national and state), other than CBSE, also participate in the competition? Yes, students from any educational board can participate in Dr APJ Abdul Kalam IGNITE competition. The children, who are out of school, up to the age of 17 years can also participate. How can the submissions be sent? Is there any limit to the number of entries submitted during the competition period? No. The students are encouraged to submit as many entries as they wish. Can there be groups or only individual submissions? Students can submit entries in groups, provided each member of the group contributes significantly to the development of the idea/innovation/project. Groups, where teachers/parents are included, will not be considered. Are there any separate awards for individual or groups? Is there any age limit for students? As the competition is for students up to Standard XII, the maximum age is expected to be around 17-18 years. Those out of school (children), up to the age of 17 years, can also participate. Can students with background other than science apply for the competition? Students from any background viz. arts, commerce, etc. can participate in the competition. Is there any particular format for submission of entries? There is no particular format for submission. However, the following should be clearly mentioned - name, age, class, school name and address, home address and contact number, title of the project/idea/innovation, detailed description, diagrams/sketches/photos if any and a simple declaration that the project has been done by the student himself/herself without any guidance from teachers/parents. If required, we may later request a declaration from school and/or parents that the project of the student has been unsupervised. Is a working model required along with the submission? Not at this stage. If required, we would ourselves let the student know and may even facilitate the development of the prototype/model later. Are any photos/videos/sketches of the idea/innovation/project required? Yes, if available. These would help our experts to properly understand and evaluate the submission. When will the awards be announced and given? The names of the winners will be announced on October 15, 2018 and award function date will be announced later. How many prizes will be given in the competition? There is no fixed number of awards. It will depend upon the number of quality entries that we receive and which can be recognise in the function. Is there going to be an exhibition? Yes, there will be an exhibition of ONLY the awarded projects/ideas/innovations. Working or illustrative models and/or posters would be required for the same. Will NIF support for travel to the exhibition? NIF will provide to and fro train travel supports to the student(s) and only one person accompanying the student(s) from the student's home location to Ahmedabad. Local hospitality will be provided by NIF in Ahmedabad. Any other person(s) accompanying the award winner or any other person interested to visit the exhibition would have to bear all their costs (travel/stay/food) themselves. What type of submissions will NOT be considered? Simple essays, write-ups on problems like population, corruption, global warming, unemployment, etc. will not be accepted as well as common projects/concepts (from textbooks/other make-it-yourself books) like hydel power projects, rain water harvesting, water level indicators, vermi compost/vermi wash, letterbox alarm and other alarms, using turbines to generate energy, electricity generation through waste batteries/dung/transport/waves or earthquake alarm, etc. and the projects guided by teachers/parents. The teachers and parents are requested not to be suggestive to the children. They should allow children to come up with creative ideas of their own. If teachers and parents have an interesting idea(s), they may send it to us separately. Who cannot participate in contest? Any student enrolled in graduation course and above; any other innovator over the age of 17 years, irrespective of educational or occupational background; children of staff in NIF, GIAN or Honey Bee Network and their relatives cannot participate. The teachers and parents of students are also requested not to send their own ideas and innovations in their children/ student's name. A declaration from parents and teachers, mentioning that the idea/innovation is an original thought of the child/student, would be required. What kind of support will NIF provide to good ideas/innovations? All practical and useful ideas/innovations may be given financial and mentoring support. In case of deserving cases, patents will be filed in their name at no cost to them. It is also possible that some of the ideas might attract entrepreneurs and these may get licensed for monetary consideration. What happens to submissions which are not awarded? NIF will review all submissions and send feedback to students. However, since the number of submissions is very high, it might take some time to respond to each one. Whom to contact in case of any doubt? NIF will provide support for patenting and incubating innovative projects into products in all deserving cases. For the last few years, NIF has been able. to file patents for each award winner of the IGNITE competitions apart from facilitating prototype development in most of the cases. Winners of the earlier IGNITE competitions have also won awards in NIF's National Competition at the hands of the President of India. Many student winners have participated in the innovation exhibitions organised by NIF at the Rashtrapati Bhavan and inaugurated by the Hon'ble President. IGNITE winners have also been selected in the Innovation Scholar-in-Residence program of the Rashtrapati Bhavan in the last three years. Many have been interviewed by leading national print and electronic media. IGNITE Awards winners are also eligible to get 10 bonus marks while applying for admission in B.Tech. program at lndraprastha Institute of Information Technology Delhi (IIITD), an autonomous Institute of the Government of Delhi. These bonus marks are in addition to the 100 marks an applicant gets based on the JEE (Mains) and class XII marks.